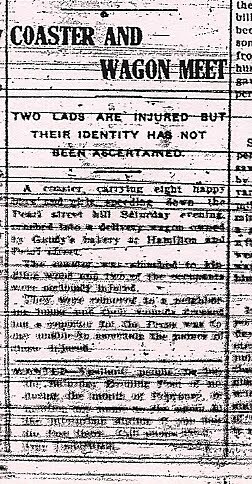 The front page of the January 31, 1910 Ypsilanti Daily Press features this story about a sledding accident on Pearl Street, in days when few Ypsilantians owned cars to get in the way. "A coaster carrying eight happy boys and girls speeding down the Pearl Street hill Saturday evening crashed into a delivery wagon owned by Gaudy's bakery at Hamilton and Pearl Street. "The coaster was smashed to kindling wood and two of the occupants were seriously injured. "They were removed to a neighboring house and their wounds [dressed], but a reporter for the Press was to stay outside to ascertain the [nature] of those injured." New York's J. L. Mott Ironworks company designed the onetime downtown fountain of Hebe, Cup-Bearer to the Gods. The company manufactured many types of statues as well as a wide range of other plumbing and household fixtures. Sad as it is that Ypsi lost her Hebe, it could have been worse. 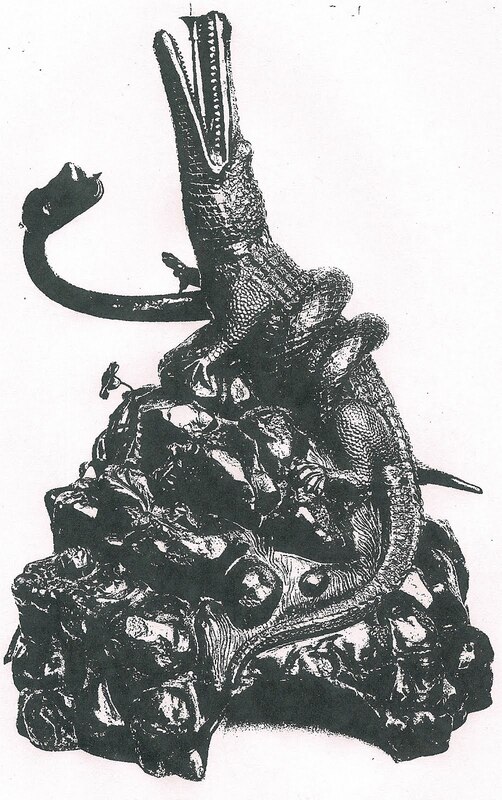 What if the city had ordered THIS statue instead, also by the J. L. Mott Co.? I'm guessing that this 1890 monstrosity would never have "disappeared"--who would want it? And we'd have this to look at, down to this day. Or is it kind of awesome in its sheer ugliness? Hmm...now I can't decide. In the spring of 1864, 24-year-old Sarah Jane Norton, her 28-year-old husband Austin, and the couple's infant son Charlie emigrated from Sharon Springs, New York, to Ypsilanti. Sarah kept a diary over the next 43 years until her death in November of 1906. 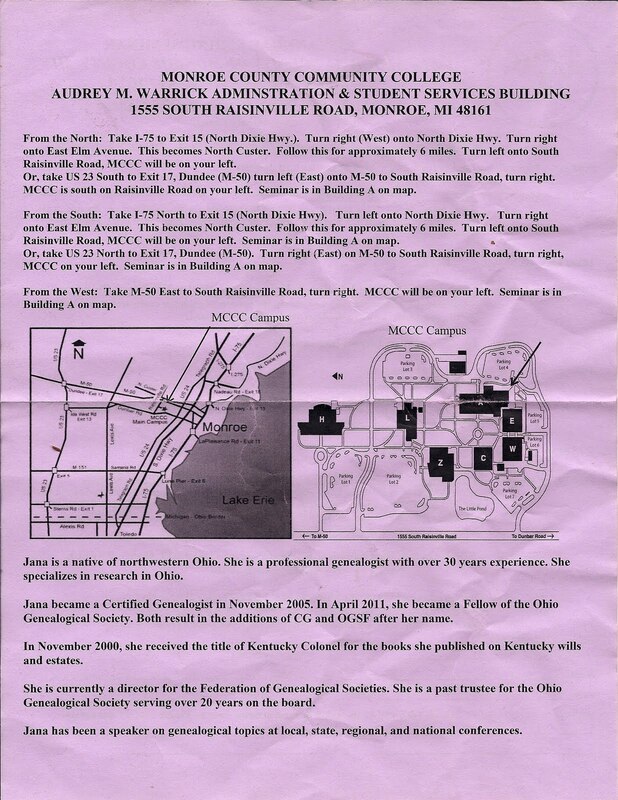 Her 1864 diary will be serialized here during 2012. To see all entries to date, see the "Sarah Jane Norton" tag at bottom. 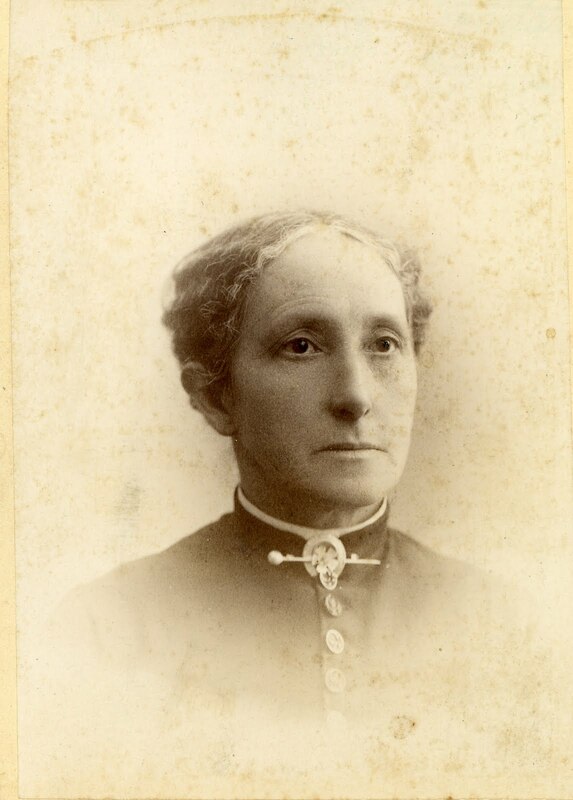 At left she is pictured in 1888 at age 49. 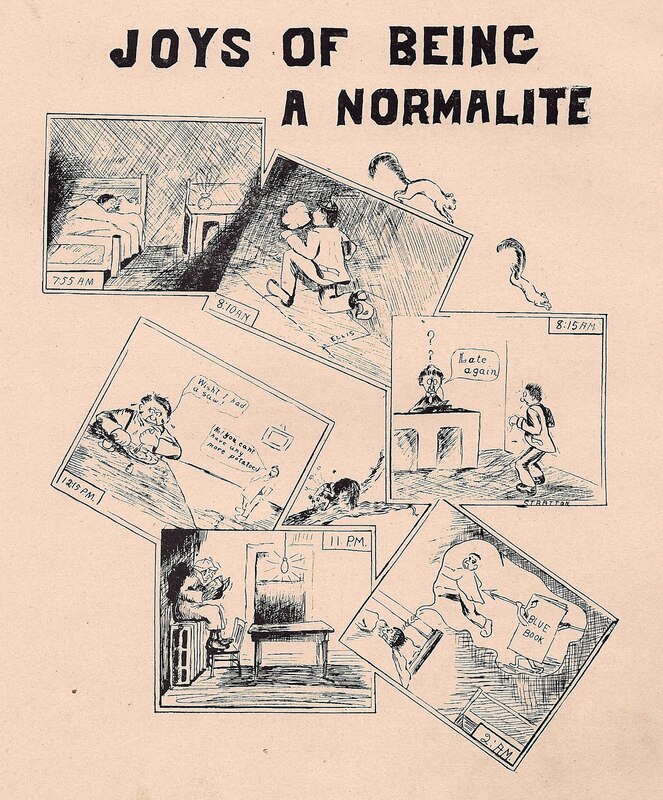 Introduction to the Norton family. These diaries were written by Sarah Jane Norton and are the property of the Norton Family. They may be used and reproduced for genealogical and historical purposes only. No commercial use is allowed without the express, written permission of Dennis Norton and no charge may be made for, nor income derived from their use. This is a bill from the onetime Ypsilanti Gas Company, a municipal utility supplying coal gas to homes all over town for cooking and lighting. The gas generator plant stood at the northeast corner of Forest and Huron, where the DPW yard is now. The plant operated as a municipal utility from 1914, when the city seized control, to the late 40s, when it switched over to natural gas and external ownership. Here is a DIY bill in case the meter reader couldn't come in your house--presumably meters were indoors in those days--and a lot of moms were at home to be able to let them in. 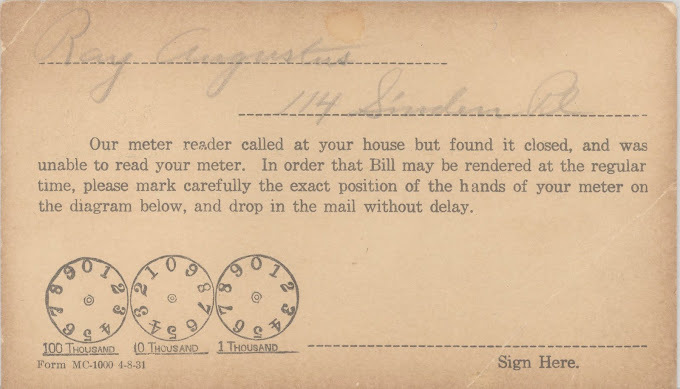 If not, you could just fill in the numbers yourself and mail it in to be billed, as seen on this undated sample which I would guess is from the late 20s-ish (?). ETA: Reader Paul found a date: 1931. While nosing around in a box of old maps the other day at the Archives, Dusty D found this gem: a 1921 beauty by the Auto Road Map Co. 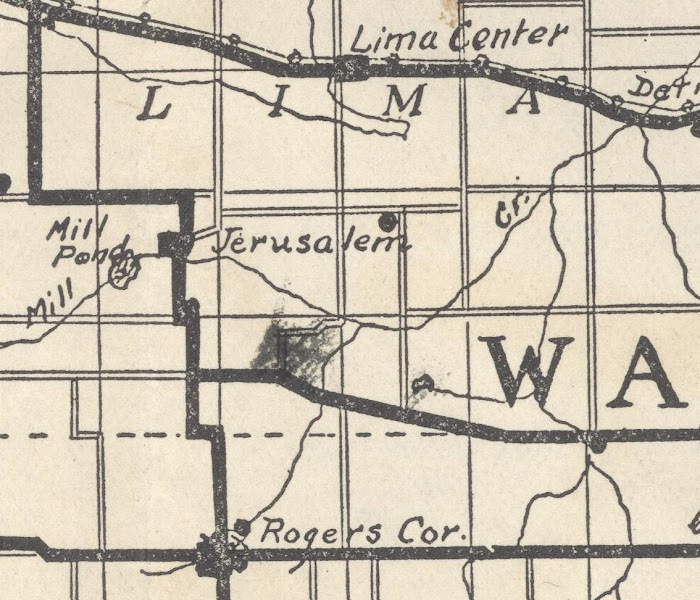 The map contains many details of vanished communities, railroads, and waterways. Before ever seeing the copyright date, I noticed that Ford Lake was missing. This tipped me off right away that the map was made pre-1931, which is when Henry Ford dammed the river and began to create Ford Lake. One now-vanished railroad is the old Huckleberry Line, then called the Lake Shore and Michigan Southern. You can see it exiting from the northern part of Ypsi and curving down to Saline, from which it continued west. You can also see the branch of the Detroit United electric interurban following alongside the "Chicago Turnpike," now Michigan Avenue. Remember the recent "cold wave" story? They threw a plow on one car, which was filled with photographers recording this novelty, and tried to forge through to Saline but the line was closed for literally weeks. A branch of the old Ann Arbor railroad (still in use) is also visible, leading down to Urania. Urania was not a settlement per se but just a station name. It was named by one Thomas Richards who campaigned successfully to bring a railroad to Milan. He named it for his wife Urania Richards. 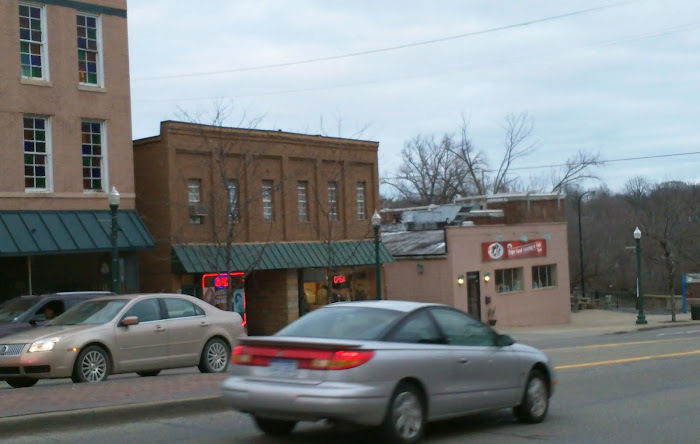 Another section of the interurban connected Ypsilanti and Ann Arbor. Here you can see a westward section of the Detroit United line traveling out to Chelsea...and beyond. How Dusty D would love to go back in time and take a leisurely ride on one of the cars. Last and most nostalgic IMO are the many little settlements on the map, now vanished. Here you can see Lima Center, Jerusalem, and Rogers' Corners, all west of Ann Arbor. Just south of these is Fredonia, which is still referred to as an existing community on the Freedom Township website. Many others are just vestigial names, like Mooreville, with only old cemeteries remaining to remember the onetime founders and residents of these tiny communities, long gone. What did municipal charity look like before mid-Depression federal welfare programs? Find out (thanks to the Chronicle)! Meet the guys at the barber shop thought to once have been at 24 1/2 North Huron. 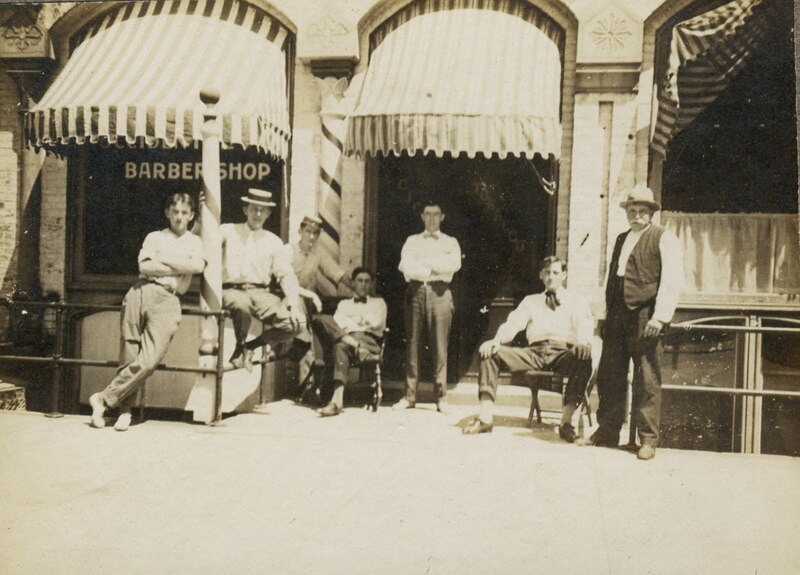 The caption for this YHS Historical Society Photo Archives photo states "The inscription identifies it as Courtez R. Hall's barber shop but it is also possible it is William Hipp's, long at that location. The gentlemen are, from L to R, Watson Laidlaw, Ralph Smith (listed in the the 1912 city directory as a clerk that boarded at 24 E. Congress), Wesley M Dawson (1890-1964) who was a partner in the Martin Dawson company and later Ypsilanti Postmaster, Courtez R. Hall, Samuel Spring, James Tweedie (listed in 1912 city directory as a barber in Hipp's barber shop and boarding at 108 Buffalo, Hipp's residence) and an older man not identified (perhaps Hipp)." The puzzle is whether the modern photo is indeed a match for the original. What do you think? Obviously many changes have been made to the building facade...but are the bones the same? 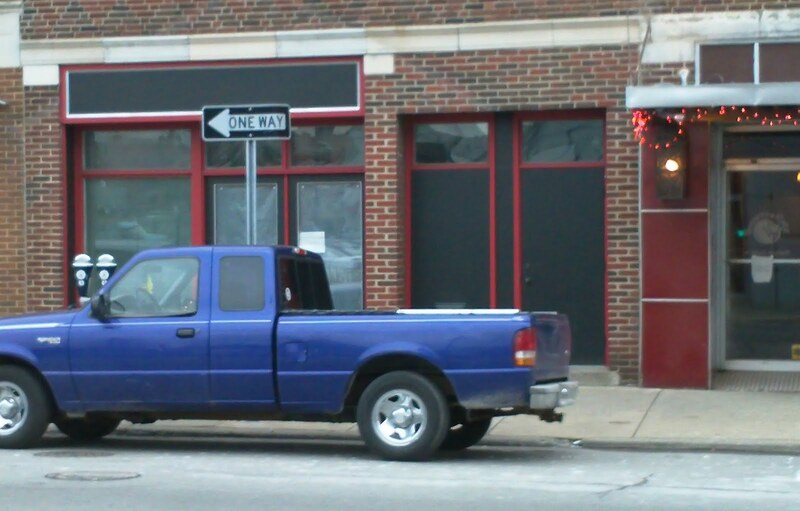 Is this the onetime barber shop? There has been some agitation among the city authoriyies during the past week as to what would happen if a tramp who has been confined in the city jail should become ill with smallpox as was recently the case in the Ann Arbor jail. How would he be cared for and where? The city has no detention hospital and no pest house fit to keep a person in. What would become of him and how could he be isolated from the public to precent the spread of the dread disease? Mayor Towner stated to a Press representative today that he had given notice to the Board of Health that something definite must be done in the near future to provide for such an emergency. One plan that has been suggested is that a portable pest house should be purchased by the city and placed on the property near the Water Works station. Three portable houses may be purchased of a firm in the northern part of the state at a reasonable figure. One or more rooms could be purchased just as desirable. These houses are strong and warmly built and are put together with staples. A meeting of the Board of Health and the Council will probably be held very soon to discuss the advisability of such a purchase. 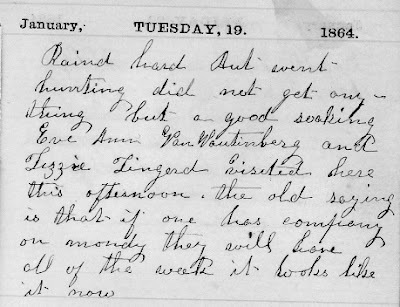 1/25/1864: Thawing yet Aut is to work for R Hanson to day I washed. Charlie was very cross he is more trouble than he used to be. full of mischief to, as he can sh[r]iek I went to the stoar and left Charlie with Mrs. Stoffor[d]. 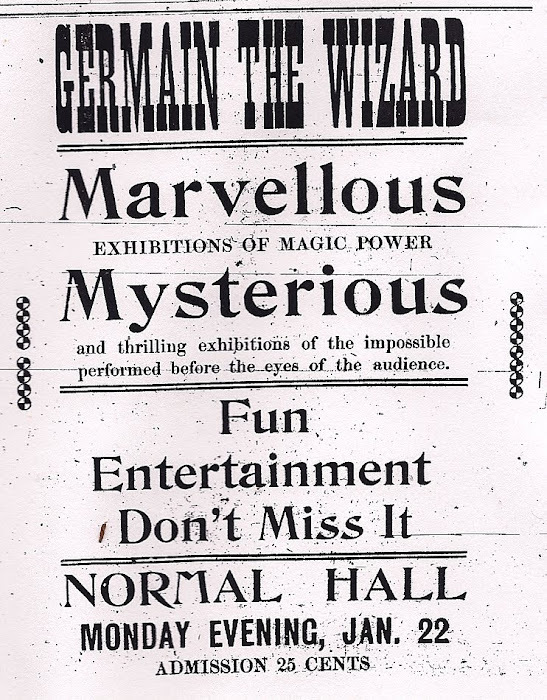 This time of year 100 years ago, Normalites were treated to a bright spot in the usual semester lecture course: a magician. The lecture course was a public cultural series for students and townspeople, the latter of whom could buy a series subscription. The onetime nearby Tubal Cain Owen family (whose landholdings were eventually absorbed into the expanding campus) had one such subscription, and Tubal's daughter Abba Owen frequently went to hear the latest lecture, in the late 1800s. Germain certainly holds no bars in his ad for himself but I have been unable to find the tiniest scrap of any documentation of any performances elsewhere, so his precise stature in the world of magic is uncertain. 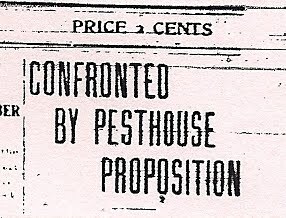 At any rate, here's his ad and a write-up in the January 18, 1912 Normal News. In this winter 1900 photo a group of about 25 veterans of the Spanish-American War march westward on Michigan Ave. They have just crossed the "Old Iron Bridge," the onetime structure and name of the Michigan Avenue Bridge. In the background may be seen the Nichols and Panek upholstery store. 1. Student waking up in his austere boarding house room (long before dorms at EMU, students boarded around town in boardinghouses approved by the school or in private homes). 2. Running down Ellis street to class. 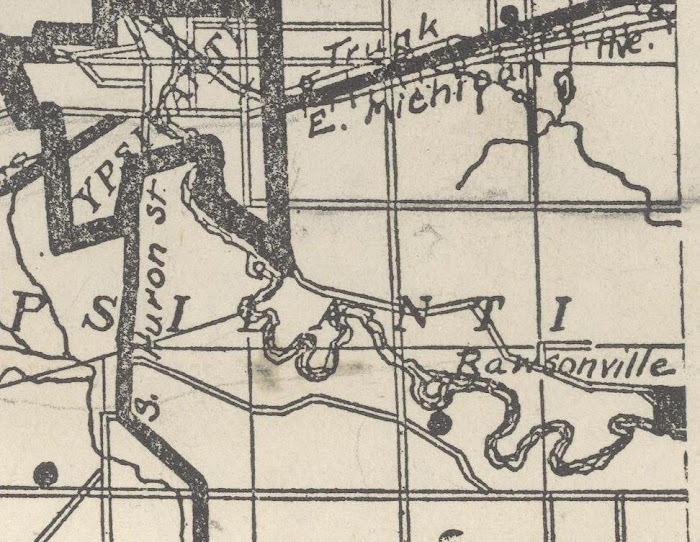 Ellis was the onetime name of the stretch of Washtenaw between the water tower and Huron. 4. Back at the boardinghouse for "boardinghouse hash" for lunch, with landlady scowling in background. 5. Studying on the radiator in a chilly boardinghouse room. 6. Nightmares of the dreaded blue book! In school you and I learned about the era of trusts and monopolies in the late Gilded Age and early Progressive Era. 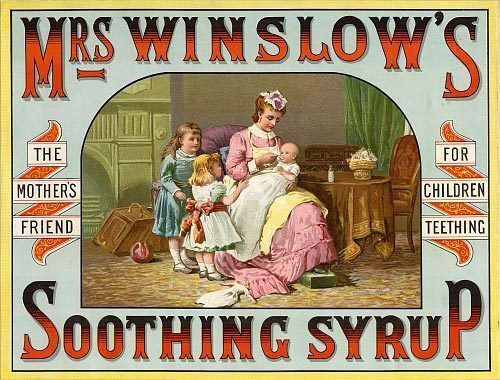 Standard Oil, the Chicago-St. Louis meat packing giants, U.S. Steel, gigantic railroad companies, American Tobacco, and even a group of linseed oil manufacturers. But in the winter of 1912, a rather unusual cartel had been hauled into court and grilled about its anti-competitive practices. 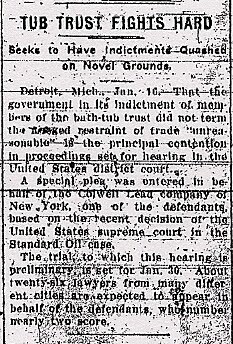 In the papers, as here in the January 16, 1912 Ypsilanti Daily Press, it was referred to as the "bathtub trust." 16 manufacturers of bathroom enamelware, led by the Standard Sanitary Manufacturing Co., colluded to arrange to use a set of fixed prices to sell their wares to plumbers. The case went to the U.S. district court in Detroit and eventually to the Supreme Court, which ruled the group's practices illegal under the Sherman Anti-Trust Act. The Sherman Anti-Trust Act was passed in 1890 to eliminate businesses' collusion to restrict market competition among them and control prices. The Act came into heavy use during this era of trusts, but is hardly irrelevant today. In 2003 the band the String Cheese Incident sued Ticketmaster, claiming that the ticketing giant was violating the Sherman Anti-Trust Act. The case was settled out of court for a settlement and a non-disclosure agreement, perhaps sadly. And thus are linked a contemporary Colorado jam band and the clawfoot tub you remember from your grandmother's house. Though Ypsilanti has enjoyed mild winter temperatures of late, a century ago a cold wave gripped the nation from Louisiana to the upper Midwest. In Chicago, the homeless population wrapped their feet in rags. Some regions recorded temperatures of 50 below. It would turn out to be the nation's second coldest winter in all of its history, and would one day get its own (somewhat half-baked) Wikipedia page. 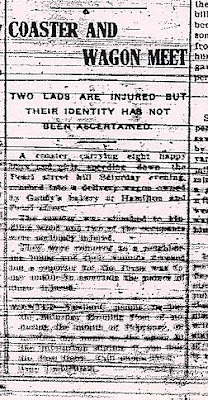 Every train coming into Chicago was running from one to ten hours late, according to the story accompanying the headline at left, from the January 13, 1912 Ypsilanti Daily Press. 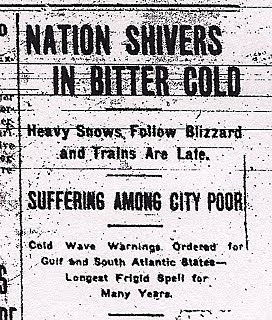 The cold wave took its toll locally as well, as noted in another front-page story in the same issue of the paper. The victim was a coal deliveryman who apparently fell from his wagon, hitting his head and presumably becoming unconscious. 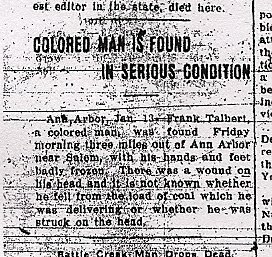 He was found with "hands and feet badly frozen." 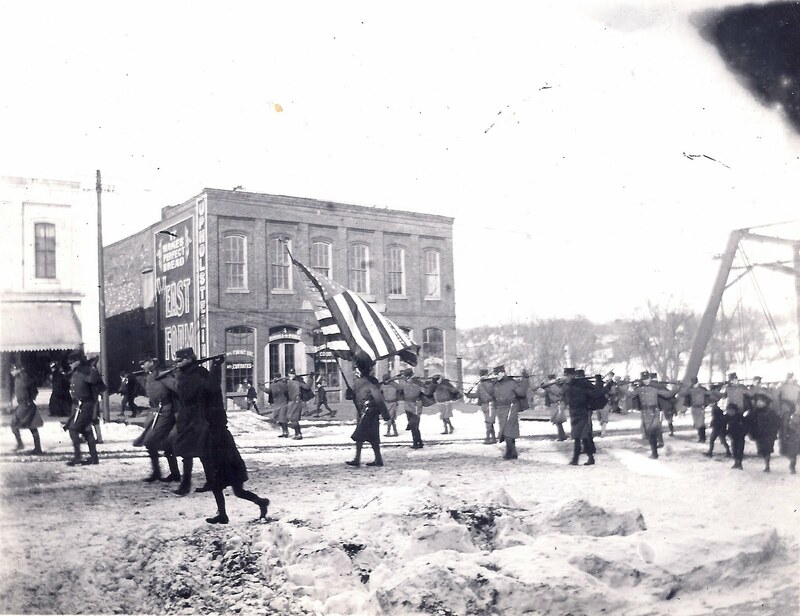 The cold wave took a while to move on, and for a while a century ago, especially among the poor in Ypsilanti, locals were put to severe strain to combat the relentless threat. 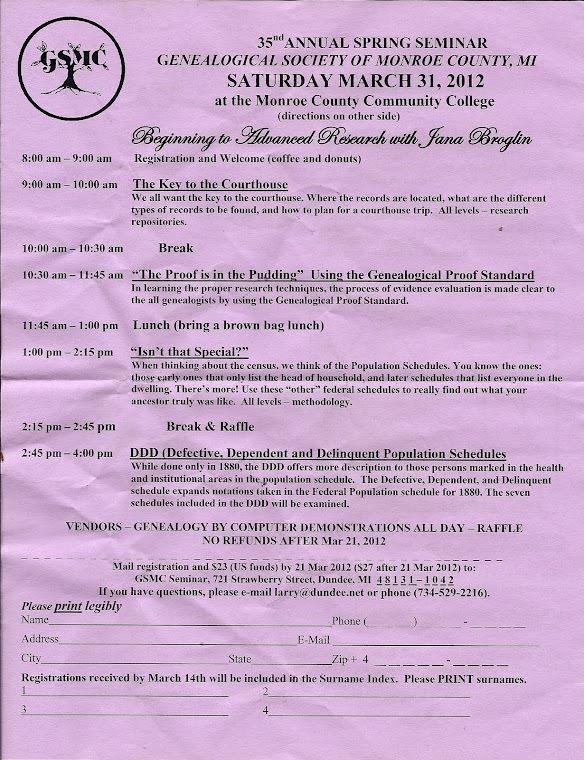 What sounds like a pretty worthwhile genealogy seminar is coming up in late March down at Monroe County Community College (not far--it's the Dundee exit off US-23). The sessions will be taught by a certified genealogist with 30 years experience. Cost is a piddly $23. Dusty D is looking forward to this! If you want me to send you this registration form as a PDF so you can register---you're just champing at the bit, aren't you?! thought so---let me know and I can email it to you. 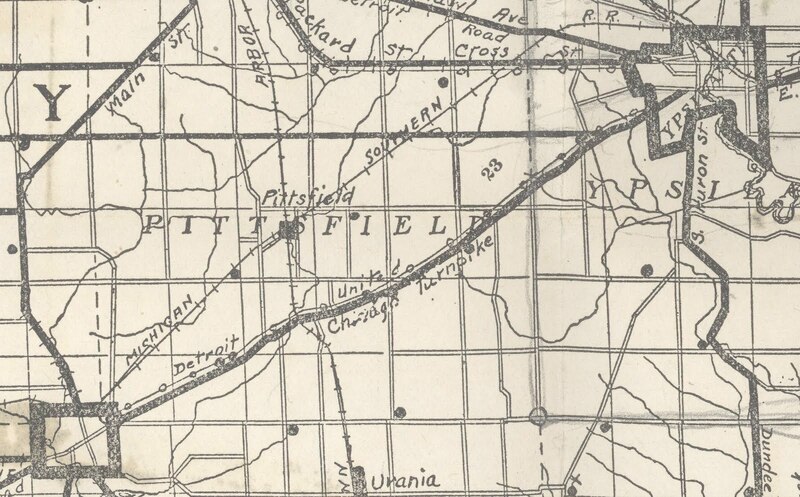 In the spring of 1864, 24-year-old Sarah Jane Norton, her 28-year-old husband Austin, and the couple's infant son Charlie emigrated from Sharon Springs, New York, to Ypsilanti. 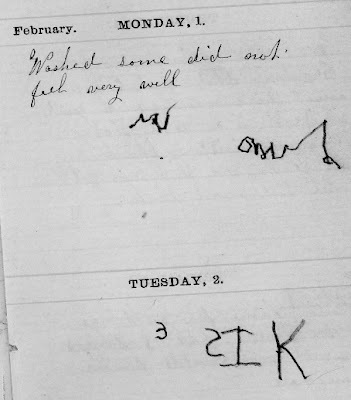 Sarah kept a diary over the next 43 years until her death in November of 1906. At left she is pictured in 1888 at age 49. Introduction to the Norton family. 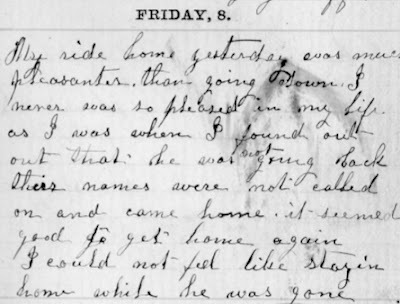 1/8/1864: My ride home yesterday was much pleasanter than going down. I never was so pleased in my life as I was when I found out out that he was not going back their names were not called on and came home. it seemed good to get home again. I could not feel like stayin home while he was gone. 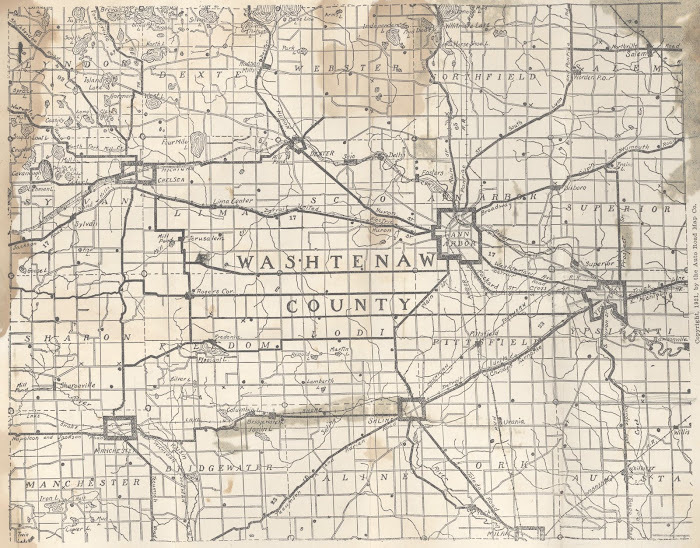 In the spring of 1864, 24-year-old Sarah Jane Norton, her 28-year-old husband Austin, and the couple's infant son Charlie emigrated from Sharon Springs, New York, to Ypsilanti. Sarah kept a diary over the next 43 years until her death in November of 1906. Her 1864 diary will be serialized here during 2012. To see all entries to date, see the "Sarah Jane Norton" tag at bottom. In January of 1864, Sarah's first diary begins with her life in Sharon Springs. In just two months she will leave home for Ypsilanti, where her mother already resides. Sarah's diary is reproduced as faithfully as possible, with no changes to spelling, grammar, or the like. 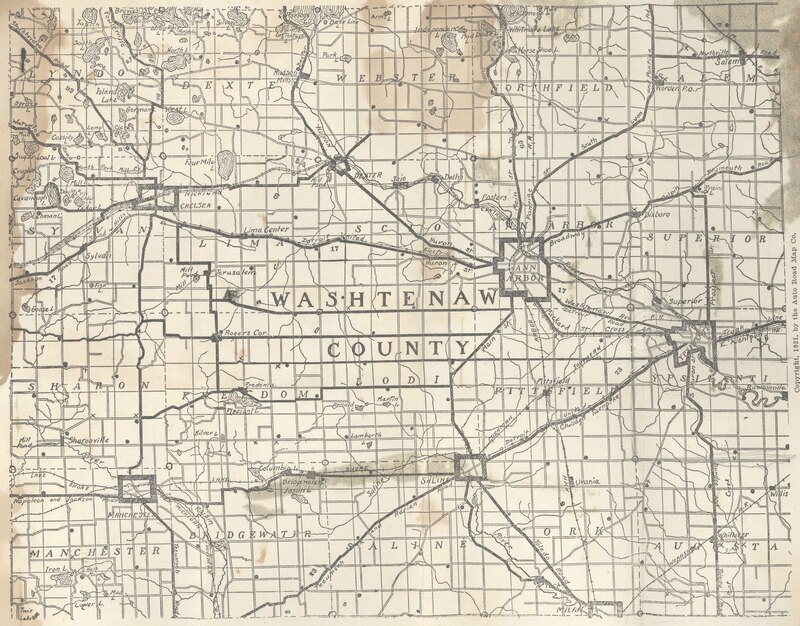 In the spring of 1864, 24-year-old Sarah Jane Norton, her 28-year-old husband Austin, and the couple's infant son Charlie emigrated from Sharon Springs, New York, to Ypsilanti. 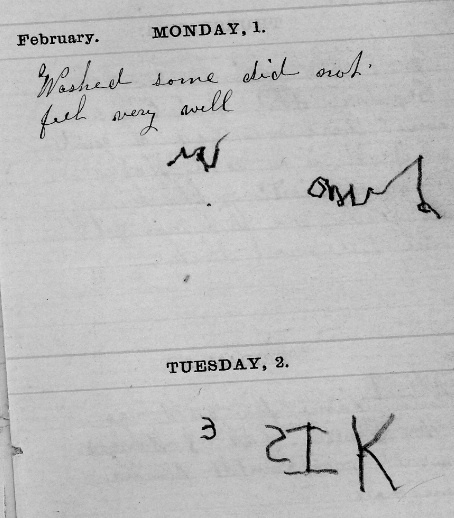 Sarah kept a diary over the next 43 years until her death in November of 1906. At left she is pictured in 1888 at age 49. Toward the end of the Civil War, Austin and Sarah Jane Knapp Norton and their young son Charles got the “western fever” as it was called then, and migrated westward from Sharon Springs, New York. 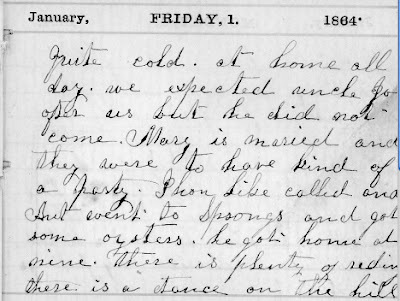 They arrived in Ypsilanti on March 10, 1864, to the open arms of Sarah's mother who had already moved to Ypsilanti some years before. Sarah's father, Lucius Knapp had passed away sometime prior to 1862, and Sarah's mother, Zada Jones Knapp then married Timothy Showerman a member of another long time Ypsilanti family. Timothy was the widower of Zada's sister Eunice. Also living in Ypsilanti at the time Sarah and Austin came from New York were two of Sarah's aunts, Lucinda Jones Casey, and Mary Jones Elliott. Lucinda was the wife of Sam Casey who had a large farm on Prospect near Clark Road, and Mary was the wife of Parmer Elliott. A third aunt, Eunice Jones had married Timothy Showerman and was living in Ypsilanti at the time of her death in 1862. As was not too uncommon in those times, Zada, the widow of Lucius Knapp, and Timothy, the widower of Zada's sister Eunice, married in 1862 and were living in Ypsilanti in 1864. 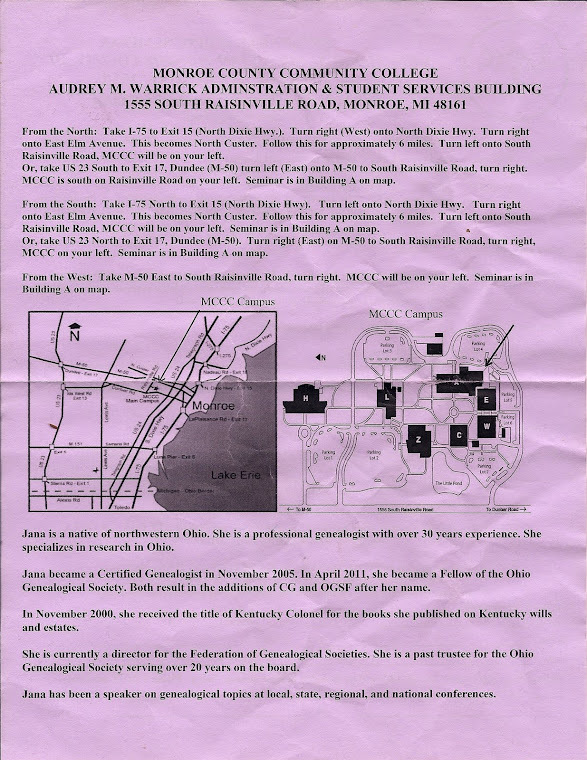 It is interesting to note that Nathalie Elliot Edmunds, a well known Ypsilantian, is a direct descendant of Mary Jones Elliot. So at one point in the late 1850s and early 1860s, four of the Jones sisters, Zada, Eunice, Mary and Lucinda were all living in Ypsilanti, having moved there some years before from Amsterdam, New York, just west of Albany. After moving to Ypsilanti, Austin Norton worked as a stone and brick mason constructing cellars and chimneys. He built the foundations for many buildings which are still in existence. 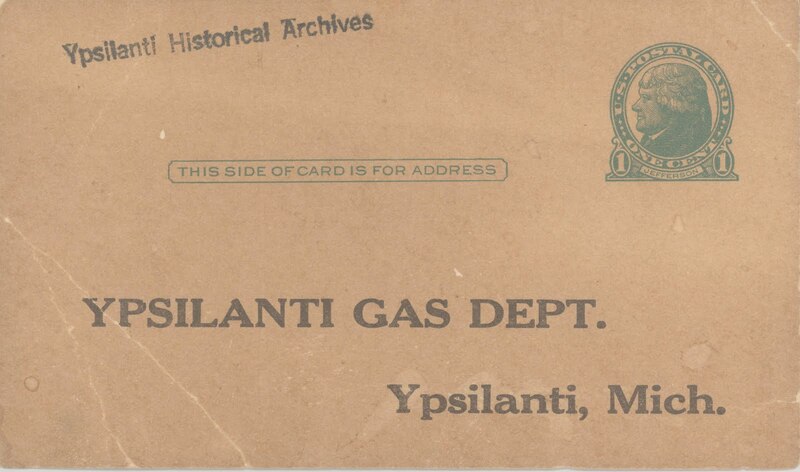 The diaries list the names of many well known Ypsilanti families for whom Austin built foundations and in some instances entire buildings. These include Elliott, Gilmore, Kirk, Cornwell, Dusbiber, Meanwell, Bassett, Lamb, Ellis, Lawrence and more. Austin and Sarah's son Frank founded the Norton Flower business in 1892. The business would be continued for five generations in the family until the retirement of Austin and Dennis Norton in 1998, when the concern was transferred to the company's management team. 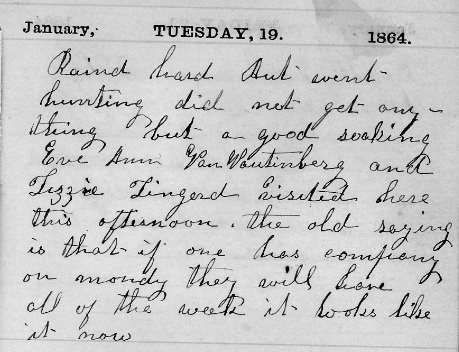 The 1864 diary is one of the oldest in the Archive's diary collection. 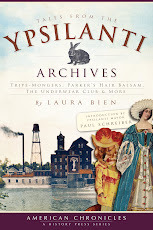 It offers a rare look at late Civil War-era Ypsilanti. 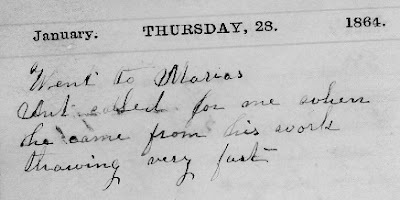 Over the next year Dusty Diary is serializing Sarah Jane Norton's 1864 diary with the permission of its current owner. Read along to learn about the life of this 24-year-old mother making a life for her family in an unfamiliar Michigan town over a thousand miles from her childhood home.